very interesting post. i'm currently pretty f*cking obsessed with a pesky chin breakout that has been with me on and off for almost a year. at the moment i don't have any new spots but the problem now is the annoying scarring. let me know if you have any advice about whitening or scar fading products. right now i use triacneal by avene and i'm seeing some results... i only use that and micellar water to remove makeup and mositurise in a 2 in 1 kinda way. i am THAT lazy. I love the Alpha H - liquid gold! Has definitely made a difference to my bad acne scars, made my skin much smoother and reduces spots! Great post. Thanks for going into detail on each product! I picked up Hydraluron a while ago in Canada. I think it's harder to get a hole of in the US. Retail wise at least. I used it for a couple days and didn't find it did anything and I have very dry dehydrated skin. Could I be pairing it with the wrong stuff? I put it on underneath John Masters argan oil and top with Dermalogica intense moisture balance. You've motivated me to give it another go! Have you tried Nano blur? I haven't tried Nano Blur but remember reading about it and thinking it sounded like a miracle... :) I think the products you are pairing it with sound good so am sad to hear that you didn't like it. Try it for a couple of weeks...I did read that some people felt that it took about 2 weeks to make any difference. Highly recommend! I also used a small amount as a moisturising treatment last night - it's fab. I've JUST bought the Hydraluron on my lunch break and I'm so glad I did now after reading this post! Excited to try it now! Yay! I hope you enjoy - give it about 2 weeks to make a difference and pair it with a great moisturiser! I love, love, love the La Roche Posay Hydreane Riche moisturiser, I did a review a while back and yep, I remember claims about the spa water carrying things 'deeper' in to the skin. Mmm double masking - I need to get on that! That sounds like such a massive treat for the skin. Like the basket idea, so simple yet beautiful. It's always so hard to make bathroom counter tops look organized while keeping it pretty. My absolute favourite moisturizer is Dr. Weil by Origins Mega Mushroom skin relief face cream, great for normal/dry sensitive skin. My skin used to be just all over the place, with zits and tons of blackheads. But, after reading about the way that French women take care of their skin, I made a few changes. 1) I stopped attacking my skin. No granular, physical scrubs. 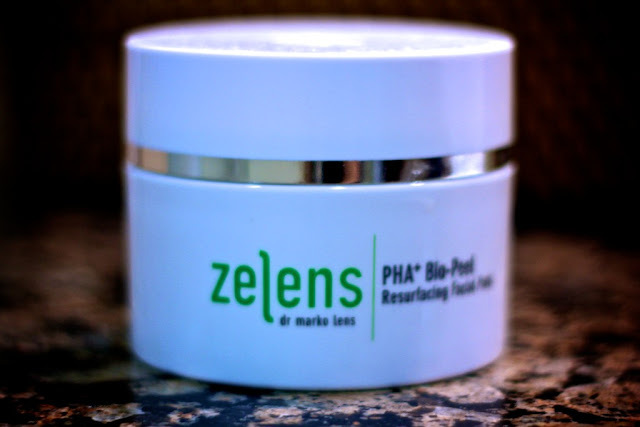 No soapy cleansers that strip skin of all natural oils. No harsh chemicals. The key word is gentle! 3) I gave my skin a break and got lots of sleep. When possible (around the house, to the coffee shop, grocery store), I didn't wear any makeup or very minimal. When I get home, I take it all off if I'm not going out later. Getting lots of sleep is an obvious one - we all look better with some good zzz's! 4) I accepted my genes. Like the colour of our hair, or the shape of our body, skin is also genetic. Whenever I meet someone with great skin, I always look to see their mother's skin because chances are, if your mom's got great skin, you will too - regardless of the skincare you use. Good luck with your skincare routine!! Everyone's skin is different, so keep trying until you find what works for you! I really loved your comment Daniela and hope that others also read it. So true about being gentle - not using too much and keeping it in balance. I am guilty of not removing my makeup as soon as I get in, I should do that...and I should really try and get more sleep. Sleep is a cure all! I too have moved away from heavy base products in recent years: the thought of Studio Fix Fluid appalls me now because i am so used to wearing tinted moisturisers or light coverage products. I thought the Hydraluron was going to be really expensive, but it's reasonably priced, so will check it out next time i'm in Boots! Yes the price isn't bad at all. Be warned though - the packaging gives you the impression that the product is also going to be big...nope. It looks like a tiny tube. On the up side you only need a teeny tiny amount! I've been so curious to try the Emma Hardie Amazing face cleansing balm. Will give it a shot after I am done with the Boots Botanics one and my MAC Cleanse Off Oil. 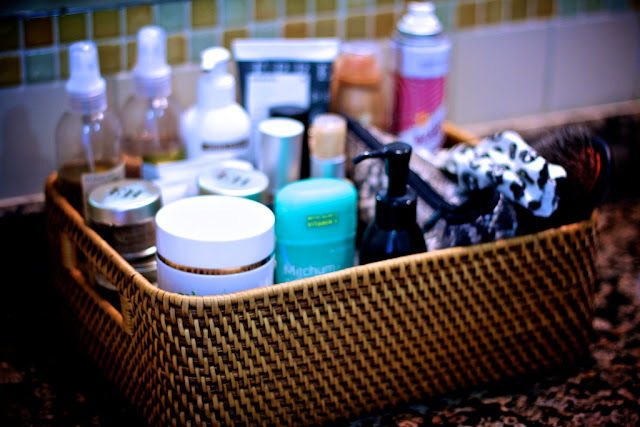 The way you organize your skin care seems to work much better than my current system. 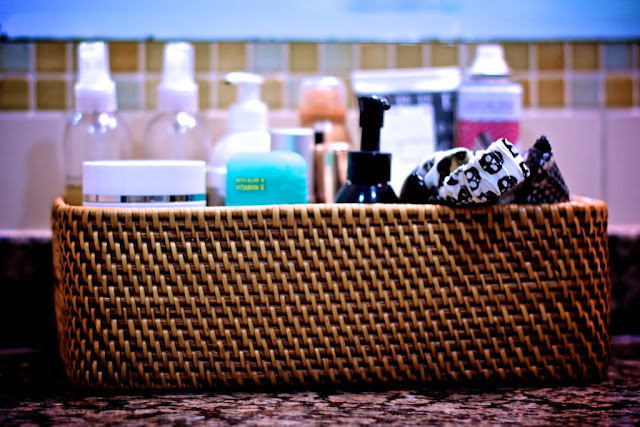 My skin care essentials just find themselves standing on the bathroom shelves in a very non-organized manner. But I won't give up on it! One day, I will figure out the perfect system to organize my skin care and make-up. I do agree on the Hydraluron, I bought it a few weeks ago on a Boots 3 for 2 sale and love it. I now remember I wanted to DM you about it to suggest it, but I somehow forgot...The Emma Hardie balm sounds lovely, I might give it a try. For my face I currently use Decleor products. Their night balm is amazing and the face oil with it as well. It moisturises really good and putting it on just is a very luxurious part of my night routine. I use the Hydraluron underneath and it works a treat! Are you not using any spf? I didn't notice any spf products in this or did I miss it? 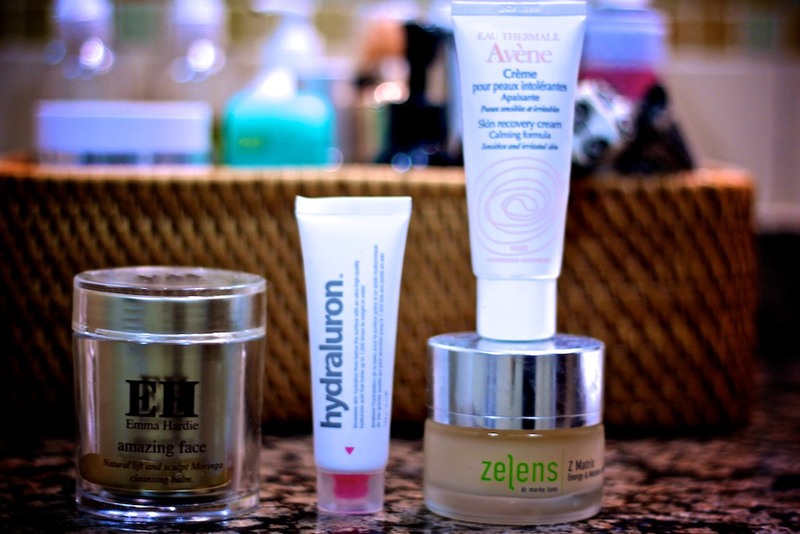 I love cleansing balm, the EH one sounds quite amazing. 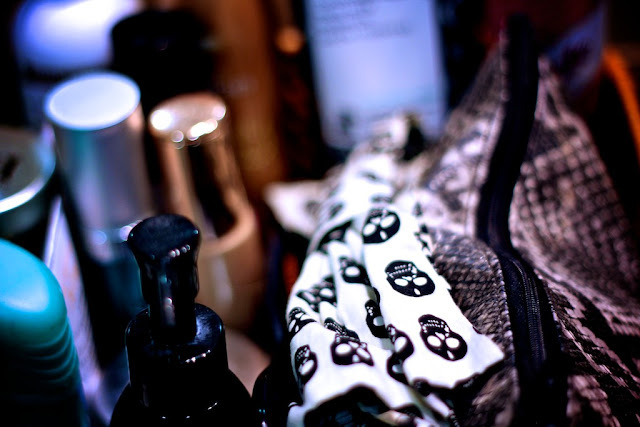 I have been using a line called Cellbone on and off and always come back to it because I love all their serums packed with vitamins, peptides, and the latest and greatest ingredients. I am also loving Natura Bisse Extreme Diamond cream. With everything that I am using, I definitely see results. Natura Bisse is a seriously luxurious brand that I have longingly looked at :) haha Glad that you see results - nothing worse that spending time and money and get nothing in return! Some fab products here :) I'm dying to try Hydraluron! I hope you like it :) It's something that should really boost your skin and perfect for this time of year i think! Neal's Yard Wild Rose Beauty Balm is a nice rich cleanser. Love the sound of that - bet it smells amazing too! I swear by two products from Dermologica the Gentle Exfoliant and the Skin Resurfacing Cleanser, they are amazing and I have to give the credit to Lisa Eldridge Skin Care videos on YT for the recommendations. I also the got Bioderma Crealine cleanser on Lisa's say so, as well which is fab for taking everything off especially stubborn eye makeup. I've just started using Weleda's Rose Day cream which is a great base for foundation and last but not least I've gone back to an old favourite and wondered why I stopped using it - Clarins Blue Orchid Facial Oil, really does fabulous things for my dehydrated skin, and the all important massage part really relaxes those fines lines plus you smell like you've been in a spa for the whole day! I have that Skin Resurfacing Cleanser and really enjoyed using it - and yes that was a purchase completely undertaken because of Lisa :) Weleda is one of my favourite brands - it never gets any marketing traction but it's fab. Their Almond and Iris range saved my skin in my cystic acne days! could you tell me something more about the Weleda creams that "saved" you from cystic acne? I'm 25 and suffer from it :( .. I can't manage to find a facecream that is hydrating but at the same time doesn't aggravate my acne.. I'm from Italy and Weleda is really easy to find here (compared to other brands that i would love to try like Ren, Zelens, etc.) so when I read in the comments that it helped you, I couldn't stop myself from asking you more info about it :) Forgive my english if I mad any mistakes! p.s. i'm super excited for your makeup post! i was a huge fan of your youtube videos and miss your lollipop26 days. any chance you'll return to the youtube world? I remember trying bio oil once and it didn't agree with me but I think I was going through a bad hormonal patch which would have meant nothing agreed. This is a good one to remember! 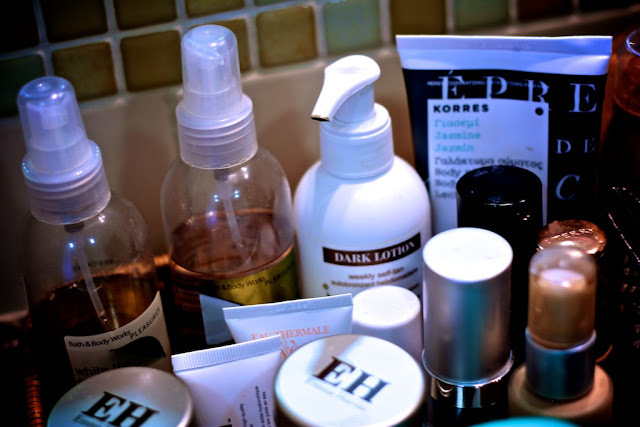 I've been putting products I need to use up front and centre like that too... it really helps and nothing is more satisfying that seeing a pile of empties, IMO. For me, I really like the brand Reversa. I'm not sure if it's only Canadian though but their products have kept my skin problem-free for years. I know :) And yes to the hydraluron. Pair it with a good moisturiser and it will be happy days! I like The EH stuff too- this has reminded me I need to blog on it. I have been using it a while. I keep researching skincare and making a note of the bad ingredients. Its amazing what some companies try to put in products!! I must admit, after years and years of ignoring my my mother's sage advice I do think she is right in the end. Stop washing your face! Make sure it's clean, but don't use tap water and foamy cleansers. Her and my grandmother both have amazing skin, and they say it's because they don't over cleanse. Garance Dore's blog also said she stopped washing her face with foamy cleansers on advice from her dermatologist and now her skin is great (http://www.garancedore.fr/en/2011/11/22/skin/). It took some getting used to, but I have to say I like the results. I use Bioderma Crealine, Kiehl's avocado eye cream, First Aid Beauty ultra repair cream, and my usual SPF and I'm good (at night I do the same thing, w/o the SPF). You have beautiful photos! What camera do you use? Hi Laura! I've been using Hydraluron for a week now and I love it, I have noticed a huge difference in the appearance of my skin although I have also developed a few little spots so I've reduced it to every other day at the moment. I didn't get on with the EH cleanser it broke me out big time to the point where I couldn't continue to use it however after reading your post I wonder if I was using too much. Ah that's so sad to hear - I did see reviews where some people hated the EH cleanser. I use a teeny tiny amount but maybe it's something about the ingredients...I guess things can't work for everyone. Now Antipodes - this I need to check out...love the sound of that Face Oil! Vichy is a great brand - I always see it in Boots and forget to check it out but like Avene and La Roche Posay, I reckon is pretty dependable. I love Darphin Camélia mask, it's anti-aging and multi-functional. It gives a really nice glow to dry skin and smells divine. Totally agree - never bought a product from them that I haven't liked! Wow, well done on your organization, my stuff is just spread out haphazardly all around the bathroom sink! I'd have to say my favorite product at the moment is the Full of Grace serum bar from Lush. It's probably more ideal for drier skins, but when used at night, it just makes my skin a bit brighter in the morning. It even looks good under makeup! Great idea for organisation and I like the sound on the Emma Hardie Cleanser and those Zelens pads. Out of interest, have you ever tried Dr Murad Laura? I haven't actually. I have heard alot about it but never really been tempted. Any recommendations? its amazing! pair with a rich moisturiser and you will love it! I thought you liked the white tea and ginger body spray?? i think that one is actually nice, what happened? The EH cleansing balm sounds so good especially with adding the rosehip seeds for exfoliation. I love balms. I think they're better for winter. Can you believe I received the EH cleanser in my beauty subscription box and have not used yet - think I will now! We don't have the same skin type but my best routine was Simple gel face wash, Simple toner, Origins Modern Fusion Serum (now discontinued) and Biotherm Acnopur. Now I'm quite loving Caudalie :) A change in pill has meant a ten day battle with some crazy @ss spots and all the big skin care guns are out! it gives me a nice idea for my products too. I think the rodial range is amazing! Neat and not excessive! also love how you don't have the same brands as everyone else seems to. Alpha-a balancing cleanser and Liquid Gold, Antipodes honey mask, Chantecaille vital essence serum, bloody expensive but worth every penny. The body shop's tea tree range is amazing. I've tried a various range of products, including the more expensive ones. But the tea tree range at the body shop is relatively cheap, and works like a treat. The face wash and toner lasts me ages, and the moisturising gel is a breath of fresh air . The night lotion also did my skin wonders. Definitely worth a try. This topics is really interesting. This site is extremely nice. your blog is so impressive, through this blog we getting the superb information which is always helpfull for us.